Featuring a selection of popular jewelry components, jewelry findings, jewelry parts, jewelers supplies, packaging, replacement stones, vintage findings and beads. There are many items not shown that are available, if you don't find what you are looking for please inquire. We request but don't require that minimum orders on supplies total $20.00 or combined with an additional site purchase from our other categories. This is due to the cost involved in packaging, shipping & internet fees on one small item not being cost effective. 221 Items. Showing Items 1 thru 15. Quality loose full drilled Japanese saltwater Akoya cultured pearl for replacements & repairs. Sold individually. Antique cuts have been gaining popularity and in demand. 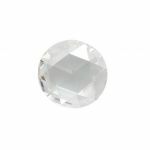 Antique style round rose cut diamonds for replacement in antique jewelry repairs, to use in antique and Victorian designed jewelry. 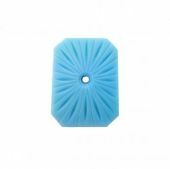 Light weight small or baby sized screw backs for threaded posts. 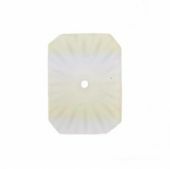 They are double threaded screw on earring backs for most of the standard sized threaded posts. Sold by the pair. Hypo-allergenic clear rubber ear wire clutches for hook style earrings. Flexible, easy to grip they provide security from stopping your ear wires sliding out of your ears. Great for young girls earrings too! 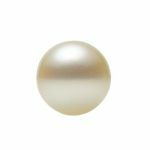 4.0mm to 7mm round white cultured Akoya pearl that is undrilled and used for replacements, repairs and in antique designed jewelry. Sold individually. 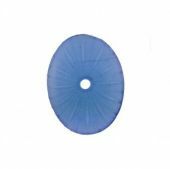 These Art Deco style octagon shaped sunray glass tablets are opaque with a turquoise blue color similar to starburst crystals. Sold individually. 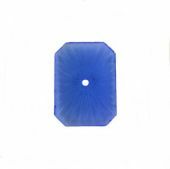 These Art Deco style octagon shaped sunray crystals have a frosted matte finish on a semi translucent sapphire blue color glass base similar to camphor glass. Sold individually. 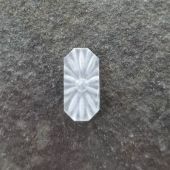 These Art Deco style octagon shaped sunray crystals have a frosted matte finish on a semi translucent glass base similar to rock crystal or camphor glass. Sold individually. 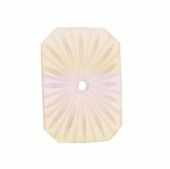 These Art Deco style octagon shaped sunray crystals have a frosted matte finish on a translucent rose quartz color glass base similar to camphor glass. Sold individually. These Art Deco style oval shaped sunray crystals have a frosted matte finish on a translucent pink colored glass base similar to camphor glass. Sold individually. These Art Deco style oval shaped sunray crystals have a frosted matte finish on a translucent rose colored glass base similar to camphor glass. Sold individually. These Art Deco style oval shaped sunray crystals have a frosted matte finish on a translucent sapphire blue colored glass base similar to camphor glass. Sold individually. 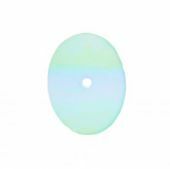 These Art Deco style oval shaped sunray crystals have a frosted matte finish on a translucent aquamarine colored glass base similar to camphor glass. Sold individually.